While I was meeting up with fellow conference delegates from Lewisham on Sunday night, the results from the German general election were being forecast and announced. 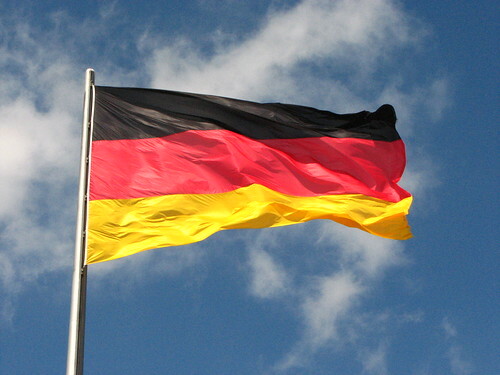 As expected the German conservatives increased their share of the vote and the number of seats in the Bundestag, the lower house of the German Federal Parliament, but their parliamentary allies and the source of their parliamentary majority, the Free Democrats (FDP) failed to reach the threshold required to get seats. The FDP have been voted out of the parliament and consequently the right wing are five seats short of a majority. 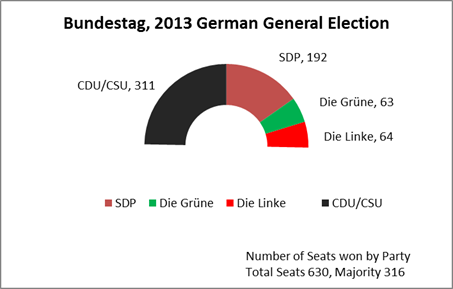 Since the other three parties in the parliament are the Social Democrats (SDP), the Greens (Die Grüne) and the Left Party (Die Linke), as Gregor Gysi, the leader of Die Linke points out in his article in the Guardian, How serious is Germany about its democratic principles?, there is a nominal left majority since the Greens have only ever allied themselves with the SDP in government. The likely government will be a coalition between the CDU/CSU and the SDP. Gysi argues that the SDP’s historic refusal to ally with Die Linke is under challenge with the SDP and by historical necessity and that despite Merkel’s ‘victory’ there is a historic opportunity for the German left. Further analysis of the impact in Germany’s domestic politics is carried in an article by Robert Scheele, called “Merkel’s Pyrrhic victory: the end of the „conservative-bourgeois“ neoliberal model? Will the loss of the FDP tear Germany’s conservative union of pragmatism and populism asunder?”, published in webzine called LeftEast. He argues that Merkel and the right will get their majority in the Bundestag, probably by forming a coalition with the SDP but the loss of the FDP and their replacement by the SDP will drag the weight of the new coalition leftwards. The SDP will not want to repeat their experimentation with the policy corollaries of triangulation and Merkel, although not all her party, nor her allies, is happy to try and outbid the SDP on their own turf. In fact, it’s partly Merkel’s economic populism that has led to the SDP’s failure to make inroads into her majority, together with the memories of the Schroeder SDP government’s labour law reforms. This compromise with the SDP will be made easier because she no longer has the weight of the Free Democrats who were the main exponents of market supremacy, and particularly labour market efficiencies. Scheele argues this competition to ‘win’ the mind share as the champions of the ordinary people, workers and families will drive the dynamic of the new coalition. Scheele also points out that there is a bigger left majority in the Bundesrat, the German federal upper house which will increase the pressure on Merkel, who has a massive personal mandate, to move to the left (or centre). 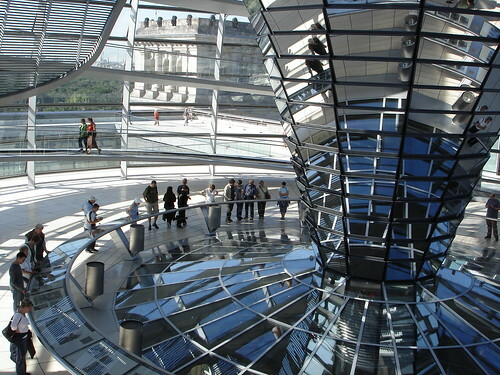 But while there are pressures to move to the centre, there will be opposition from the countervailing forces in parliament, their Bavarian allies, the CSU, and outside Parliament, the Alternative fur Deutschland (AvD) who failed to enter parliament. The result also places pressure on the Greens. They also are split between left and right, and this is based on having two seperate voting constituencies. Scheele argues that their right, are the genuine conservatives; but capable and supportive of social solidarity. They oppose development, oppose higher taxes, on wealth and property and are hawks on the issue of southern European debt restructure. He argues that many of them voted CDU this time, and that Merkel is co-opting the right Greens. The Green’s have also lost some of their left as they turn their back on pacifism and support the government’s domestic and international austerity programmes. So Merkel has a problem, she can trim left and jeopardise her relationship with CSU and empower the AfD, such an approach might encourage the Greens to support the government or she can try and co-opt the SDP into a right-wing government appeasing the CSU and giving the AfD nowhere to grow. The former strategy jeopardises the right-wing hegemony, the latter strategy will be hard with a left majority in both houses of parliament. Scheele is obviously making a polemic, and often the left is hopelessly optimistic but he may have a correct insight, after all unlike me, he does live there, and so Merkel’s position is not as powerful as the exit polls and headlines suggest. What’s this mean for Britain? The first thing is that the CDU are still likely to be unhappy at Cameron leading the Tories out of the European Parliament’s centre right party and the new government will be marginally less inclined to negotiate revised terms of membership. It will want to pursue increased political integration within the Eurozone, increased integration of banking regulation, at least and be less keen on allowing Britain to repatriate the social chapter. They are also likely to be more hostile to Britain’s defence of financial services industry, for internal populist, German national interest and euro zone management reasons. Scheele’s exposition of the left/right forces contending against the CDU may well be a prediction as to what may happen in the UK. Cameron’s plan to negotiate EU treaty changes between now and after the election, kicking the can up the road, will be hard to maintain in the febrile atmosphere of the UK’s politics. The right of the Tory party and UKIP will not allow him to be the ‘heir to Blair’ he claims to want to be. This will be exacerbated by a failure to negotiate acceptable terms. A German government containing the SDP, chastened by Gerhard Schroeder’s supply side reforms will not want to undo any more social protection in Germany, and not want to allow the UK to be an off-shore source of cheap labour, even if the UK could outperform either Eastern Europe who speak better German than UK workers or workers from Turkey, after all while Turkey is outside the EU, the UK is outside Schengen. Is the disappearance of the FDP a harbinger of what will happen to the Liberal Democrats? In Germany, the crucial change maybe the collapse of the FDP. In the UK, UKIP and its fellow travelers in the Tory party are clearly a problem to the pro-capitalist, social liberal faction leading the Tories, to the extent that they can’t even govern with the LibDems let alone compete for votes. Cameron wants to emulate Merkel and Blair, but won’t be allowed to by his party and its right-wing hinterland. Cameron has neither Merkel’s popular mandate, nor the freedom of movement and he too risks loosing his parlieamnetary majority through a collapse of the LibDem representation on the House of Commons. We also have a lesson for the remaining Blairites in the Labour Party. One of the reasons that the SDP vote failed to rise, while that of Die Linke did is that the SDP remain smeared with the memory of the last SDP led government’s flexible labour reforms. I expect Merkel to govern with the SDP as its junior partner in coalition. We’ll see if her prediction, that the smaller party always get screwed remains true. It’s hard to believe that the SDP will allow her to do it twice. I wonder what it would take to create a Broad Left alliance in Germany, but I suspect the anti-communism of many, or some, in the SDP is too strong. While much of Die Linke’s support is old, maybe the hope is that their children will tire of capitalist’s bogus promises of freedom and look to the Left to build a better society. Will we have to wait for the children of Eastern Europe to forgive their parents? ← What was said at the ORG meeting on the surveillance state?